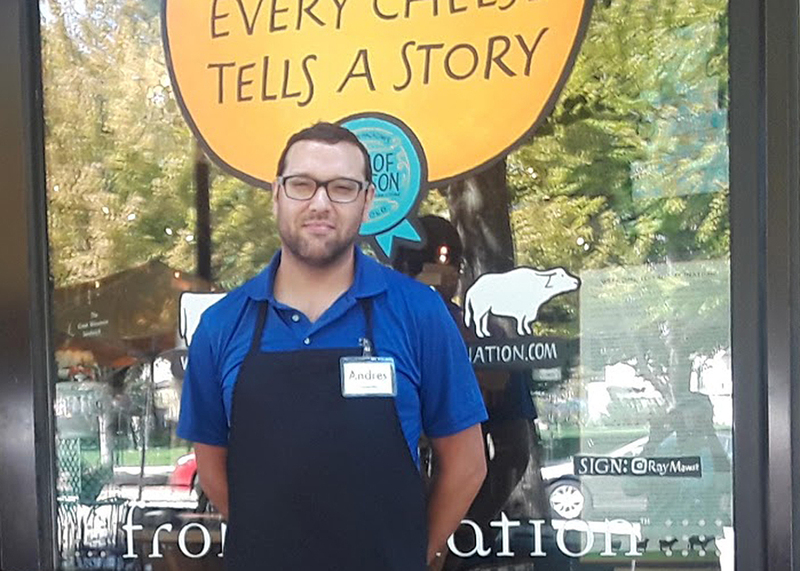 Andres started out not knowing much about Wisconsin cheese culture, but now he is a seven-month cheesemonger at Fromagination. Andres had already decided why Fromagination was his first pick for employment. A cheesemonger’s first day on the job is always a chance to learn. Andres arrived at the shop in early March. According to some customers, Andres has already become an expert! But Andres hasn’t always been in the Wisconsin cheese community. As with most cheesemongers, Andres has his favorite cheesemakers, one of whom lives here in Dane County and founded Bleu Mont Dairy. Andres thinks that cheese is a universally popular food. And what is Andres’ favorite part of the cheesemonger job, you may ask? “Being able to help people find what they love and the joy on their faces,” he said. This entry was posted by Kyle Richmond in News & Announcements and tagged cheesemonger. I’m a cheese lover and I want to meet a cheese master. Any food with cheese is perfect. So whatever food is that as long as it has cheese I will eat it. Lol!